I bet you thought I wasn’t coming back! Yes it has been 5 months since the last update so I have alot to tell you. In May, I went whitewater rafting down the Grand Canyon again with Advantage Grand Canyon. This time I did the upper section and I went in paddle boats and kayaks. This is much more exciting than going on the larger motorized boats. The video of the trip is below. In July, I went to Colorado and did our annual mountain biking trip in Crested Butte. The vacation video is the second one. I went back to Chicago to take a look at my Evanston condo. It was empty during the month of July so I was able to see it and get it all cleaned up for my next tenant. While in Colorado, I looked at some Crested Butte property. My friends and I have always wanted to get a vacation home there. There are townhomes that were about $1,000,000 at the peak which are selling for $650,000 right now. After looking at a bunch of them and running the numbers, we realized that it just did not make any sense. We would put down $200,000, rent it out as a vacation rental, and still be negative $800/mo. My SLC townhomes have appreciated a little. I thought about selling them and had a real estate agent run a CMA. The CMA was not high enough for me to want to sell the townhomes so I’m renting them out again. The rents have increased in that area about $200/mo. So I can potentially increase my cashflow to $500 a month from $300 a month when their leases are up. I sold my Ferrari last week! I was driving it less and less in the past few months and it was just sitting in the garage most of the time. So it was time to sell. I put it on Ebay and received alot of inquiries. It took me 3 weeks to sell it. Which brings me to my final real estate update. I’ve been looking at properties in a specific condo complex for a while now. In fact, back in 2011, my dilemma was to buy an $80,000 condo (short sale) in this complex or the Ferrari. So now that the Ferrari is sold, I’m looking at these condos again and one came on the market 2 days ago at about $115,000. I’m going to put an offer in and see what happens. Obviously, the decision to get the Ferrari is going to cost me $35,000 in appreciation and also the cost of ownership of the car, which would make this condo decision swing about $70,000! I don’t regret my decision at all, but it’s sort of crazy when you look at it in terms of just straight money. This condo rents for about $800, so when you factor in all its expenses I would get a return of about 5.5% on my cash. My online stores took a huge hit in June and July. They were the lowest months I’ve ever had since I’ve moved to a warehouse. I think I may have just broke even as my monthly expenses have been going up. I hired a marketing company to take over some of my PPC campaigns and customer retention. They have a 6 month contract so we will see where that goes. August has recovered nicely as the first 15 days were very good. I’m importing more and more stuff and the warehouse is at 100% capacity. My inventory is sitting there waiting for Halloween and Christmas season to come. I vow to not run out of inventory this year! Amazon sales have been doing well. I have been sending shipments to their warehouses every week. We are trying new things out there by shipping them a couple new items. When they sell out in a few days, we ship them more and more and more. It just keeps growing. A couple of my friends have new businesses which recently launched. Urban Trike – These adult big wheels are pretty cool and turn heads wherever we take them. You can also find them on kickstarter right now. Ecom Lab – This is an ecommerce store training company. Membership gets you access to videos made by fellow successful ecommerce store owners. 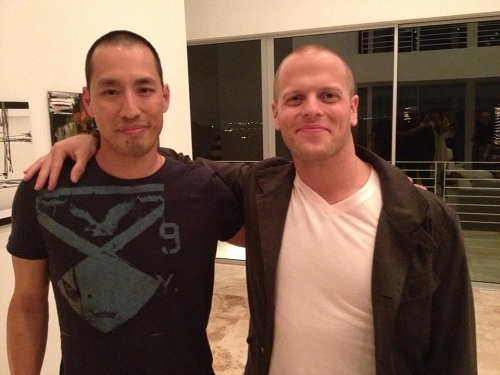 Met Tony Hsieh, the CEO of Zappos at a dinner party. Went to a pitching session where startups got to pitch their new business to investors for 5 minutes. Not quite like Shark Tank, but like a mini-Shark Tank where no investors made offers. Met a bunch of new people at many other events. I think the highlight of the week was when I met Tim Ferriss and was able to tell him how I started my e-commerce store based upon his first book the 4 hour work week and how it has grown into a full fledged business. I think the best thing about going to SXSW Interactive is that you meet people who are very similar to you. Almost everyone I met was a business owner. Many were founders of small start-ups trying to get traction and many had huge businesses already. Actually, coming home I sort of felt lazy because it seemed like everyone there was working on so much stuff compared to me. I can’t believe it’s been 2 months since my last update. I had a good December again and sales were up from last year. We did over $100k again in revenue. Growth is slowing down year over year, but at least it’s still growing. I did not end up expanding my warehouse space, although I am still looking to do that. There are a few new challenges now as I get further into online retail. The business is still growing but things are changing. Google algorithms seem to change constantly now and brand building is now super important. Keeping my stores at #1 in Google is more difficult now, but I’m also moving away from relying on that so much. The direction I’m going seems to be wholesale and Amazon and maybe brick and mortar. I know I said that before but it’s a slow transition for me so I’ll probably be mentioning it more. I hate having to talk about it so vaguely, but I’m sure you understand why. I have a couple new products coming in finally. The minimum quantity on these is kind of alot since it’s a new design and print on fabric. They have to print new fabric and the minimum is around 500 square meters of material. So it’s definitely a commitment. But initial reaction to my product have been decent so I’m going to take the risk and make the order. I went to Antarctica over New Years and it was probably the best place I’ve been in all my travels. It was a 11 day cruise from Argentina. Here is my vacation video from it. And lastly, that new business in 2013 that I mentioned a bunch should be getting off the ground. I should be posting a link to it in a few months! October turned out to be a very good month after all. With a strong run in the last week we push well past $100k in revenue. The next thing I focused on was Black Friday. We ended up running a couple black Friday sales and they did not convert as well as I thought they would. However, Cyber Monday turned out to be a very good day. November turned out to be a decent month. Amazon sales are growing very fast. Ebay sales are non-existent. We are into the busy Christmas season now. I had a couple huge shipments arrive from overseas. In fact, I even shipped some by air so they would get here in time. That get’s expensive as each box costs about $200 to ship here and only contains 10 products. That adds $20 to the cost of each product. But it is still well worth it. With all the inventory in the warehouse now, it looks like I really need more room. I put an offer in last week for the space next to us. If accepted my total office area would become 4,000 sf, which is huge! For 2013 I have a couple goals in expansion. I want to do more Amazon and wholesaling to brick and mortar. If that works out I will need that space next door and a forklift! Also in 2013 I have another new business that I’m going to start up. I have to do it next year. I feel like I took 2012 off in terms of growth, so I will push in 2013 to launch something new. Sorry guys, this blog is just not a priority anymore. I’m trying to update it as I remember to. September was good month, it was about the same as last September so I was very pleased with it. In fact, if I count my Amazon sales, this September was pretty good. So far October is well behind last year’s October. In 2011, I almost hit $100k in revenue and we are going to fall short in Oct 2012. Competition and Google’s algorithm changes have definitely put a dent in my sales. I am concentrating on making more products and rolling them out for next year. I’ve been sending samples back and forth with China so things are moving. Amazon is moving alot of volume for me. I need to keep sending them inventory. At this rate, I am pretty sure I will run out of stock this Christmas. I didn’t plan properly for it and I only have one final shipment coming from China for the rest of 2012. I have not talked about this in a while. The truth is that I don’t even look at my REI holdings anymore. My townhomes in Utah are being managed by a good PM company and all I get is direct deposit every month. I look at the bills sometimes but usually I don’t pay attention to them. I did see that they replaced the carpets in my other townhome in exchange for my tenant renewing their lease. I have had good tenants in there for the past 2 years. No evictions or missed payments. My condo in Chicago is doing pretty well. My tenant pre-paid the rest of his lease a few months ago. That’s always nice. My Avondale house keeps having repair issues. I think I’ve replaced the AC unit ($2400), shower faucet ($240) and garbage disposal ($200) in the past 3 months. The good news is the tenant has been there ever since we’ve had the place and has always paid. In return, I always fix anything that is broken quickly. I don’t know how much longer she will be there, when she moved in her kids with in grammar school. Now they’ve graduated high school already! Here is my video from my trip to Africa last month. Wow, this is probably the longest I’ve gone without an update on my blog. In August I went to Africa for about 2 1/2 weeks to do a safari. The photo from above is a photo I took while in Africa. All the lions in the photo are young cubs just playing around with it. I got back last week and it’s time to get back to work. You will be happy to know that my business ran smoothly while I was gone and I did not have to do anything at all. I think this is one step closer to my vision of a 90% passive business. August was a good month for the stores. The busy season is beginning now and things are ramping up. A big change for me is going to Amazon FBA. That means that some my products are now sitting at an Amazon.com warehouse and that they are eligible for Free Super Saver Shipping and Amazon Prime 2 day Free Shipping. This has lead to a large increase in Amazon sales. I am hoping for a good solid season selling there. Ebay sales are pretty sporadic. I’m not sure why it’s not selling on there, the pricing is the same. This is all still part of the plan of become less Google dependent. The Facebook campaign is doing ok. The hardest part is finding decent content to post on Facebook. Good content gets many views and a few likes. If I do this consistently, my fan base will continue to grow. I won’t know how this will translate into sales until Black Friday when I plan to post my huge sales on there. I have some new products in the making. This process is a little more complicated in that I have to pick out fabrics, design the patterns, design the apparel and then roll it out. I’m actually shooting for fall 2013 on my new product line. I feel like this is just the next logical step. Sorry for the short update. I’m trying to type this on my tablet and it’s not easy!